If you're looking for a cereal that tastes and smells like a simple, vanilla-frosted, yellow-batter cupcake, look no further. Cupcake Pebbles taste remarkable similar to cupcakes. Mind you, this is the flavor of the simplest cupcakes - nothing gourmet or complex. When a middle-class family has a kid's birthday party and has to feed a dozen-plus kids on the cheap... this is the flavor they often serve. So the question remains... is a cereal that tastes like inexpensive cupcakes any good? It's not horrible. It's not great. The box gives the impression that this cereal might be sickeningly sweet. 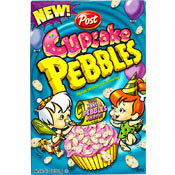 Even the title of "Cupcake Pebbles" is partially covered in frosting of the front of the box. This cereal isn't necessarily sickeningly sweet, but you do get what you pay for and it is very, very sweet. The reality of the sugar content is 11 grams of sugar per each 3/4 cup serving. That's a fairly high amount, but considering the box promotes the cereal with images of giant cupcakes and two hyper-active prehistoric children (Pebbles Flintstone an Bamm-Bamm Rubble), I was expecting a higher amount of sugar. To put that 11 grams of sugar in perspective: Lucky Charms also has 11 grams of sugar per serving; Froot Loops has 12 grams of sugar per serving; Wheaties Fuel has 14 grams of sugar; and Cheerios has only 1 gram per serving. The vanilla cupcake appeal of this cereal is initially impressive. It seriously smells like a cupcake the second you open the box. That sensation carries over to the first few bits. But unfortunately, mid-way through your serving, the cereal starts to taste bland. The excitement of eating cupcakes for breakfast wanes quickly as you realize spoon after spoon of cupcake flavor is both overwhelming and unexpectedly boring at the same time. If you like the flavor of inexpensive cupcakes and you think you might like that flavor for breakfast, run out and pick up a box. But do it soon. This one probably won't be around very long. Other nutritional considerations: Each 3/4 cup serving has 120 calories, 1 gram of total fat which is 1 gram of saturated fat, 26 grams total carbs, 0 grams dietary fiber and 1 gram of protein. What do you think of Cupcake Pebbles? When I first got this cereal, I had my doubts. I didn't know what to expect. Yeah, you could assume it would taste just like a cupcake, but I was a little nervous to try this hyped up cereal. Finally, I went to Kroger and bought the only box left. I went in the car, pour the gallon of milk in the box, and ate the cereal. I ABSOLUTELY LOVED IT. The texture, the taste, the presentation, it's got it all. (Life Hack: If you let it sit for a little, like 30 minutes, it gets all soggy so you can drink it like a smoothie. Thought I'd let my fellow civilians know) peace, love, and happiness! This was my favorite cereal. I bought 3 boxes at a time and now they discontinued it. Why?! Please bring it back. I'm so disappointed it's gone. 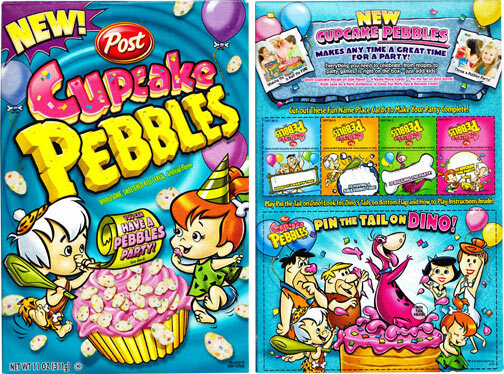 Please sell Cupcake Pebbles online and deliver it to Sri Lanka. Recently tried it as the box was labeled "NEW" recently. Loved COCOA (classic) and like FRUITY. I thought these were bland and dull. I like vanilla cupcakes with vanilla frosting (which some might find dull period), but the artificial tastes didn't sit well with my taste buds. I ended up giving the cereal away after one (maybe two) bowls. These are okay. The artificial cupcake flavor is present, but they're extremely sugary. I also can't stand getting to the bottom of the bowl and having to fetch all the stranded pebbles. I must say, I have been looking for this product for the longest time. Does anyone know where I can buy this? I absolutely love this cereal. It's great with milk or just as something to snack on. Not too sweet, and very light. I love this cereal! When I first got it, I ate it about 2 or 3 times a day (yes, I know, that's sorta bad for you). I love it. I want to buy more, but my weight tells me "Get the Cherrios! Get the Grape-Nuts!" so... I would love to get it for a dessert sometimes! The flavor wasn't as strong as I would have thought it would be, it was pretty boring to eat. I do however, love the new Marshmallow Pebbles and of course Fruity Pebbles. Meijer has this as well. Now if they'd only come back with Strawberry Shortcake cereal from the 80's. That was the best! I got this cereal thinking it would be just as good as cocoa or fruity pebbles. This cereal smelt like cake batter from the time I opened the box until about the first bite. It was horrible. It was really bland & now I've got a whole box of cereal I will probably throw out. It's not that sweet, and agree with reviewer, the taste fades quickly after a couple bites. This cereal is very tasty! I tried it and I can't stop eating it! The mixture of cake batter and frosting is delicious! Great Job! It's passed midnight, and I went to Giant Eagle JUST to get this. And I have to say I'm a slight bit disappointed. It's not foul by any means, but I wouldn't buy another box. I will suggest that it would possibly be an okay mixture in a bowl of ice cream perhaps? Other than that, I'm sad to say: I'm not a fan! I just bought it at Walmart. I was nervous they wouldn't have it because I wanted to try making rice crispies out of it. So, here it goes. I hope they're good! Totally amazing!!! Also I dont think a few small handfuls can give u diarrhea & make u THAT sick! I would get to the doctors quickly. Anyways everyone in my family loves this cereal. I loved rice crispy treat cereal & was so bummed when it wasn't made anymore. This does remind me of that. The idea of making gooey homemade rice crispy treats with this instead of plain rice crispys is BRILLIANT !! The only issue I have is u cant find it anywhere! Thats so frustrating too! I got mine on a shopping trip in Portland 2hrs from my town at Walmart. So my only issue with this cereal is that its not wide spread enough yet, its too hard to find!! Best thing I ever had. And I personally hate sweets. 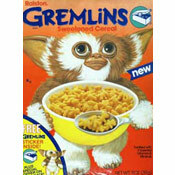 I am trying to find this cereal and can't, any suggestions? I ate a few handfuls of this cereal. I am a 19 year old otherwise healthy female, and this product gave me diarrhea, nausea, and a bad stomach ache for the rest of the day. When they say this product is 'sickenly sweet', they mean it. I'm on my 7th box in two months. My 9 year old loves it and so do I. My husband will even eat it. We decorated cupcakes for her B day party and all the kids and adults thought it was so cute and tasted good. Not sure why the reviewer didn't care for this cereal but it vaguely reminds me of Rice Krispy Treats Cereal and is actually very tasty bite for bite. I found mine at Wal-Mart. I tried Cupcake Pebbles this morning. It tasted delicious! I got it on Saturday at Market Basket in Salem, New Hampshire. Post Cereals have done it again! This is their newest product! Great job to Post Cereals! It tastes so delicious, I would give it to my family. Use the cereal to make "Rice Krispy" treats except with Cupcake Pebbles. YUMMY! I got the cereal at Walmart. My three kids love this cereal. The Post brand is also cheaper than the other brands which is a plus. Who can really deny their kids cupcake memories? My sons birthday is coming, and they want to use the cereal for cupcake sprinkles. I tried it myself, and I must admit I liked it to. Smells like baked vanilla cupcakes when you open the box. Where do you get this cereal? My four year old daughter loves the cupcake cereal.